If you or a loved one were injured in a cruise ship accident in the Florida area, you may be entitled to receive compensation for your injuries. Speak with a Miami slip and fall lawyer to discuss your available legal options. Cruise vacations offer a way for passengers to travel to exotic locations from the comfort of a ship, with various off ship excursions. Several passengers spend weeks looking forward to the excitement of the cruise ship, only to have their vacation cut short by a terrible injury sustained while on board the cruise ship. Injuries and accidents which occur while on board a cruise ship can have devastating results and may result in a complete cancellation of your trip, or at least a substantial modification of your plans. Our injury attorneys are here to explain your rights and fight for compensation. Cruise ship accidents can include a wide variety of accidents, although the leading type of accident on a cruise ship is a slip and fall accident. The cruise ship staff is responsible for ensuring that all areas of the cruise ship are kept free from any hazards that could injure the passengers, such as puddles of water or rusted ladders. Other passengers may fall ill after an outbreak of norovirus, which often has detrimental and trip-cancelling effects on any victims who catch the virus. Cruise ships owe a high duty of care to their passengers, and must ensure that the premises are free from hazards, or that any hazards are adequately communicated to all passengers. The failure to alert passengers of hidden dangers (such as slippery floors or ladders) could have dire consequences for the passengers. Our Miami cruise ship accident attorneys understand that no one wants to spend money to go on an amazing cruise vacation, only to have the trip cut short due to the cruise ship’s own negligence. Cruise ships operate under a unique subset of the law. Since the accidents often occur outside of state or federal waters, it can be difficult to bring a claim for injuries. However, cruise ships themselves are corporations which have a United States base, many located in Florida. As the victim of a cruise ship accident, you should not delay in bringing a claim for damages which will cover your medical expenses, trip expenses, and any additional expenses resulting from your injuries. An experienced personal injury attorney in Miami, FL will be able to assist you in determining the full amount of expenses you are entitled to receive after a serious cruise ship accident. 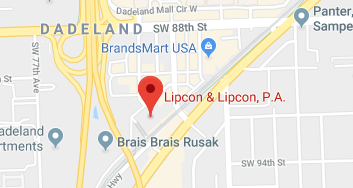 If you or a loved one has been injured in a cruise ship accident, do not hesitate to contact the attorneys of Lipcon & Lipcon, P.A. Cruise ship accidents not only ruin your vacation, but they can require extensive recovery and medical expenses. In extreme accidents, a victim will need to be helicoptered out of the cruise ship to be properly treated. The victim’s primary focus should be on their recovery, and not on the financial burden of their injuries. Call our Miami office at 305-670-6144 or contact us online today for your free initial consultation and we will begin working on your claim for damages.